21. Why do monks go on alms round in the morning? In order to appreciate this act, one needs to have a background understanding of Buddhist society, Buddhist society consists of four groups of people: monks, nuns, laymen and lay women. Monks and nuns have left household life and have gone forth to spend time fully in the study and practice of Buddhist teaching. Once they are well fortified with study and practice, they are expected to teach the lay people and provide them with spiritual comfort and guidance. Lay people, on the other hand, are householders who are still engaged in worldly activities. It is expected that able Buddhists should support the ordained ones by providing them with material requisites such as food, clothing etc. Buddhist societies are expected to work out this compromise division of responsibilities. When the monks go for alms round, from the monk's point of view, they are to make available the opportunity for the lay people to make offering to the ordained ones who are a "field of merit", worthy of offering. Also taking care of the material needs of the ordained ones is a way to reinsure the stability of Buddhism and its institution on the one hand and also to uplift the lay peoples' own practice on the other. 22. How is universal loving-kindness taught in Buddhism? Loving-kindness (Metta) means extending good-will or benevolence which is opposite to ill-will. Buddhism teaches that loving-kindness should be diffused to all sentient beings, be they human or non-human. If the world follows the teaching of diffusion of universal loving-kindness, conflicts may be solved not by confrontation but through peaceful means. 23. What is the Buddha's teaching about caste and colour? There is no division of caste and colour in Buddhism. In some country, the caste system is a very important social structure. However, Buddhism is free from caste, racial, and gender prejudices. Everyone is equal in spiritual potential. The Buddha explained that a man's virtues or vices depend on his deeds, not his birth or wealth. One who comes to be ordained in Buddhism has equal rights such as the right to vote in meetings. The only difference is the order of seniority which goes according to the precedence in ordination. Buddhism lays stress on human equality by pointing to the importance of knowledge and good conduct. The Lord Buddha taught that one who is endowed with knowledge and good conduct is excellent among divine and human beings. 24. What is the Buddhist attitude towards ecological problems? 1. Not to throw the rising of the bowl mixed with lumps of boiled rice into the house compound. 2. Not to ease oneself or spit on grass and green. 3. Not to ease oneself or spit into water. 4. Not to cut any living plant. 5. Not to burn the forest. 6. Not to throw waste through the window. 7. Not to leave the toilet dirty without cleaning it or asking others to do so. Buddhists are encouraged to maintain the balance of nature and material development. Recycling of used material was already mentioned in the Buddha's time. In Buddhist teaching, life is a part of nature. Everything is interdependent. So the concepts of natural conservation and ecological awareness can be found in the teaching of Buddhism in the early period. If we now take a trip to rural villages, we could visit the Buddhist monasteries and enjoy the feeling of serenity, fresh air, the beauty of flowers and trees, pets and tame animals living happily together with human beings. 25. Is it true that Buddhism is pessimistic? In this sense we will see that Buddhism is neither pessimistic nor optimistic; it is rather realistic. The Buddha may be compared to a medical doctor who diagnoses that human beings do have a severe disease, but he did not stop there. He pointed out that it can be overcome and further prescribed medicine to remedy it. Buddhism seeks to overcome human suffering. Each individual needs to develop morality, concentration, and wisdom in order to solve the problems of life. Buddhists are taught to face the world in its reality and try to overcome its binding forces and ultimately arrive at spiritual freedom which is known as Nirvana or Nibbana. 26. What is the purpose of Buddhists in worshipping and making Buddha images? Buddhists cast Buddha images and statues as reminders of the Buddha. People of various countries designed national flags to represent each of their own countries which are held as important, worth of respect. Such practice does not imply paying a respect to the cloth or its colour but to the highest national institution. In the same manner, Buddha images and statues also are objects of respect. Our respect does not aim only at wood or metal which Buddha images are made of but mainly at the 3 qualities of the Buddha, namely: wisdom, purity, and compassion. A Buddhist paying respect to a Buddha image is away of reminding oneself that one needs to improve one's own wisdom, purity, and compassion in order to follow the Buddha's triple quality at the same time. 27. What is the real meaning of "merit making"? Literally speaking, the word "merit" is translated from Pali Punna which means "purification: To make merit is to cleanse greed, hatred and delusion from one's mind. The Buddha taught His followers to make merit by means of charity (Dana), morality (Sila) and spiritual development (Bhavana). When we know the real meaning of "merit making" in Buddhism as described above we can decide for ourselves that there are many ways and means to make merit. At any moment in one's daily life, even while sitting comfortably on a chair, trying to cleanse greed, hatred, delusion or other mental defilements from one's mind is also reckoned as making merit. 28. What is the real meaning of "dana" (giving)? which is of two kinds: development of tranquility (Samatha-bhavana) and that of insight (Vipassana-bhavana). There are three kinds of giving, as follows. 1. Giving to the needy, e.g. helping the poor, giving to orphans, etc. 2. Giving to equals, e.g. giving to our friends or neighbours to build up friendship. 3. Giving to people to whom we want to show our gratitude or respect, e.g. parents or monks. In the real sense, a Buddhist should give without expectation of return. In other words, to give is to lessen one's own selfishness. Hence giving is a way of decreasing craving and attachment. 29. What does it mean when a Buddhist takes refuge in the Triple Gem? A basic requirement for a person to become a Buddhist is to take refuge in the Triple Gem, namely the Buddha, the Dhamma, and the Sangha. There are levels of taking refuge in the Buddha. At one level the Buddha simply means the Buddha image which may be taken as a reminder or indicator of the historical Buddha who provides inspiration for all Buddhists to follow the path He had taken to enlightenment. The Buddha at a deeper level would mean Buddhahood, the highest spiritual quality which is available to all of us, if we follow the path the Buddha has shown. it means the highest truth realised by the Buddha, who said that "One who sees Dhamma sees me, and one who sees me sees Dhamma." That is to say, when one realises Dhamma one become enlightened. The Sangha could again be understood in different levels, generally it means ordained Buddhists: monks and nuns. In a deeper sense, it means the enlightened persons, ordained or lay, who are spiritual guides for human beings. To take refuge in the Triple Gem is to accept the qualities embodied in the Buddha, Dhamma, and Sangha and to try to develop such qualities within one's life. 30. What are the Buddha, Dhamma and Sangha? 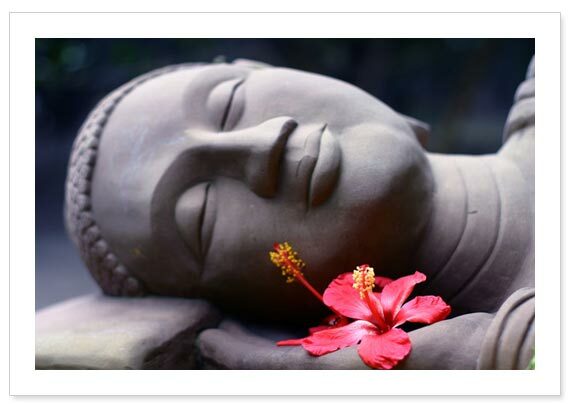 To be a Buddhist, one is expected primarily to take refuge in the Triple Gem: the Buddha, Dhamma and Sangha. Buddha means the Enlightened One. Dhamma means Truth realised and taught by the Buddha. Sangha means the Buddha's disciples who behave and practise righteously. The ideal Sangha means those who attain the Four States of Noblehood. Sangha : the Buddha's noble disciples represented by Buddhist bhikkhus (monks) and bhikkhunis (nuns) in general, who have not yet attained the Four States of Noblehood. The Sangha in this level is called Conventional Sangha or Sammati Sangha.